There are two basic types of bridge opening bids. No Trumps opening bids and suit opening bids. Once you have been dealt your cards, you should sort them into suits and sort the cards in order within those suits. Then you add up the number of High Card Points (HCPs) in your hand, counting 4 points for each ace, 3 for each king, 2 for each queen and 1 for each jack. If your hand contains fewer than 12 points you will usually pass, although there are exceptions to this. Then you look at the distribution of cards in your hand. Do you have a balanced hand? A balanced hand can’t contain a void (no cards in a suit) or a singletone (one card in a suit). It can contain one doubleton (two cards in a suit) and then 3/4/5 cards in the other suits. If you have a balanced hand you might be looking at making a No Trumps opening bid. in American standard bridge you should open with a bid of 1NT if you hold 15-17 points and a balanced hand even if you do hold a 5 card major suit. If you hold a balanced hand but don’t have the points required to make a No Trump opening bid then you should open with a suit bid. You can rebid in No Trumps later if appropriate. In American Standard bidding you should open with a major suit bid ONLY IF you hold a 5 card or longer major suit. (The major suits are spades and hearts). If you don’t hold a 5 card major then you should always open with a minor suit bid, even if you hold better cards in a 4 card major than in any of the minor suits. In Acol bridge you should open with a 5 card or longer suit if you have one – regardless if whether it is major or minor. You can make a major suit opening bid if you hold 4 cards in a major suit. Learning the opening bids in bridge is fundamental to playing the game and highlights the difference between different bidding systems. You can learn all about the opening bids in a game of Acol bridge by clicking here. You can learn all about the opening bids in a game of American standard bridge by clicking here. Hi Val. 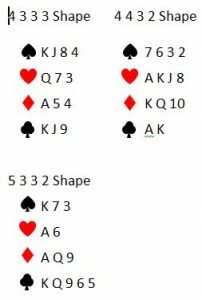 A doubleton = 2 cards in the suit, so in a 4432 shape hand there is just one doubleton, the suit with 2 cards.